“Are you sure you’ll be alright?” she asked me again before she hurriedly walked away as she was late for work. I smiled as I watched her leave me at her favorite coffee shop. My daughter is all grown up.Seeing her as a young adult warmed my heart as much as the warm chai latte that she bought me. As a mom of a new graduate, I was overwhelmed with mixed emotions. I’m still euphoric. Who wouldn’t be? I can’t even begin to tell you how elated I am with her plans. She is graduating with two majors from UC Berkeley, has a summer internship in Washington DC lined up for the summer, is writing an honors thesis while applying to law schools in the fall. As a mom these are the moments we live for.Throughout the week, I walked around the campus, tracing her daily steps. I sat in her favorite Brazilian place, I did our laundry with her in the laundromat (which was my first time to ever be in one; it was scary), I went to her church for Sunday mass. I hung out with her friends; I slept in her room. I was trying to immerse myself with the community that made my daughter grow.So when she told me that there was chicken in the freezer, I welcomed her request for me to bring a piece of our home to her Berkeley home. 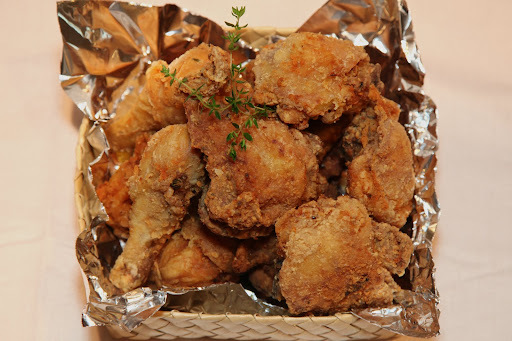 I took the apron and I cooked an old time favorite of hers: fried chicken a la Jollibee. 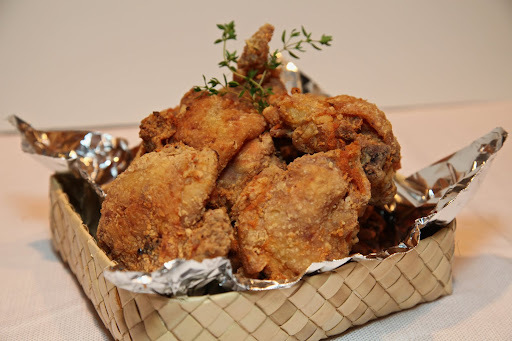 I’m sharing the recipe below but if you want to see the video on how to make Fried Chciken ala Jollibee click here. and Spaghetti a la Jollibee here . Come join me in Facebook and Twitter! 1 tbsp five spice *five spice is an acquired taste so try putting a minimum of 1tbsp first and add as you please. Marinate chicken with lemon and salt and pepper overnight or at least 30 minutes. Fill a large skillet (cast iron is best) about half full with vegetable oil. Heat until VERY hot.. Meanwhile, roll the chicken pieces into the breading. It should be crispy goden brown. There should be one in there because it’s actually used primarily in Chinese cuisine. They called it Hanyu Pinyin in mandarin, jyutping in cantonese. it’s Ngo Hiong, and can be found in most groceries in the spice section. when should I use the five spice??? marinate or breading? thank you! i’m sorry i didn’t see the comments above coz i was browsing through my phone. thank you very much for your help,ma’am! more power to you! Crispylicious!!! at jucylicious!!!! thank you po sa recipe!!!! You don’t put 5 spice in marinade. You mix it with the flour and corn starch..
Ano po ba yung five spice? Thanks po sa info…. san mkukuha ung Five Spice na sinasabi? tried this and it’s not even close to Chicken Joy. It’s tastes good though.